When a tremendous dust storm hits their habitat on Mars, the Ares 3 crew members abort their mission and begin the long return journey to Earth, leaving the body of astronaut Mark Watney behind. There's only one problem: by some twist of fate, Mark isn't dead. Now he's alone on a hostile planet with no way to communicate with anyone. Somehow, some way, Mark has to figure out how to survive for four years when the next mission will arrive. Can he do it? I'm not a die-hard science fiction fan by any stretch of the imagination, at least not since my teens and early twenties, but when trusted book sources raved about this book, it haunted me until I was forced to buy and read it. I have to admit that one of the things that drew me in was the first line. Although I do come from a family of farmers and sailors (and all the earthy/salty language that may imply), it wasn't the f-word that drew me like a magnet. There's just something about that first line that tells you even though the chips are down as low as they can get, this character still has a sense of humor. And as I well know, a sense of humor can keep you going when a lot of other things can't. 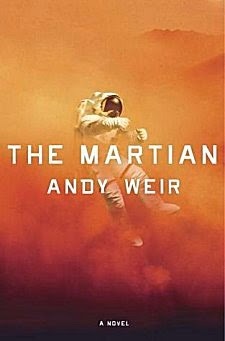 After hearing raves about The Martian and after having read it... just what is my opinion? It's a darned good book, but not quite rave worthy for me. It is written in the form of a log book, which is the perfect format. Mark is there alone; he has no one to talk to; and the only way we're going to get to know him is for him to write his thoughts and problems down in the log. Each Ares 3 crew member had to have two specialities; Mark's are mechanical engineering and botany. If he is to survive for the four years it will take for help to arrive, he has to concentrate on food and water and making any necessary repairs to the equipment and his shelter. Reading his thought processes as he works through the various problems he deals with is the perfect way to learn his character. Something happens after those first fifty pages that sets the whole book on its ear, and my interest re-engaged with a vengeance. Yes, there was still quite a bit of that "stuff" I mentioned previously, but it was easier to digest after injecting more action into the storyline. Before you think this book is nothing but technical language and action, let me tell you that Mark Watney is a gem of a character. His intelligence, his problem-solving skills, his sense of humor, how he copes throughout a situation that would make most people give up... he's one of the best characters I've read so far this year. If you like science fiction that's so good you feel as though you're on the red planet yourself, if you like survival tales, or if you like brilliant characters, by all means give The Martian a try. I'm very glad I did. Cathy - Thanks for your honest appraisal of this one. I'm honestly not much of a one for scifi, although I do respect authors who do it very well. Mark does sound like a good character, though. Hmmm....I may try this one, even with the jargon, etc.. at the start. My local bookseller has been raving about this book and is selling it with a money back guarantee but I'm still not convinced it's for me. I'd say that if you're still not convinced, you should probably stay away from it, Kathy. Good review, Cathy. I agree with Bermudaonion (that looks a bit weird when I write it) in that I'm still unsure of the book, too, but you make it sound quite unique and worthy of readers. Not sure one of them will be me, although I'm participating in the Once Upon a Time book challenge this year, so who knows.